Two editions of regional daily reporting on the end of the Second World War were saved from landfill by a collector of unusual items. A copy of a Derby Telegraph headlined ‘Germans announce full surrender’ from May 1945, when the war in Europe ended, was among 10 newspapers covering the period, which were rescued by Steve Griffiths. He found the 70-year-old newspapers among a box of Derby County football programmes which were destined for a landfill site and he is now looking for a suitable home for them. Other titles discovered the collection were the Daily Express and the Sunday Graphic. 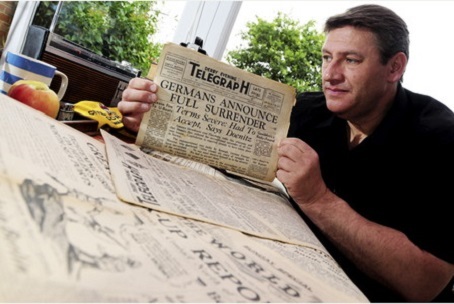 Steve Griffiths is pictured with an edition of the Derby Telegraph announcing the end of the Second World War. The Derby Telegraph reported that Steve makes model Daleks in his spare time from parts of old mobility scooters and was contacted by someone offering him two scooters after a bereavement. He said: “It turned out that they were too good to break, so I gave them to a local charity. While I was there they were getting ready to send some items to landfill and they asked if I wanted anything else. “I saw a box of Derby County stuff and decided to take it. “There are two Derby Telegraphs. They are in very good condition, but what really amazes me is the stories of life still going on every day despite the war. Steve, who is a DJ and a paranormal investigator, has ironed the papers and hopes to find a home for them where they can be displayed. It is not the first time he has found newspapers in unusual places, having previously found one from Memphis documenting the death of Elvis Presley inside a record sleeve from a charity shop. Elvis, the paranormal, Daleks, the disabled, footie and world war too! You really couldn’t make this up – unless you knew how SEO and clickbait works.